Foxlee was born in Queensland, Australia on 7 March 1920, the son of Herbert and Olive Foxlee. He joined the RAAF in 1940 and trained in Australia and Canada as a wireless operator/air gunner. After further training on arrival in England, he was posted to 455 (Australia) Squadron at Swinderby, where he quickly joined up with Mick Martin and Jack Leggo. Their first operation, in a Hampden, was on 2 January 1942. By the end of June, they were flying Lancasters. Foxlee went on to complete a tour of 34 operations by 13 September, and was then transferred to a training unit. He received the DFM for his work on the first tour, and was commissioned. 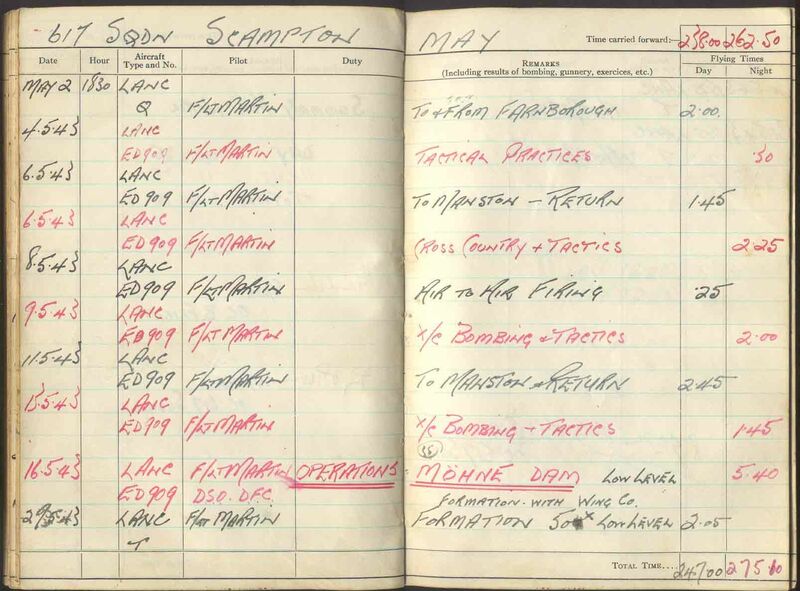 In early April 1943, he joined up with Mick Martin, Jack Leggo and Tammy Simpson again, in the new 617 Squadron, practising for the Dams Raid. After the raid, he carried on flying with Mick Martin on all his operations. Like his pilot, Foxlee was taken off operations after the Antheor Viaduct trip, on 13 February 1944. He received the DFC in April 1944, and spent the rest of the war instructing in a training unit. 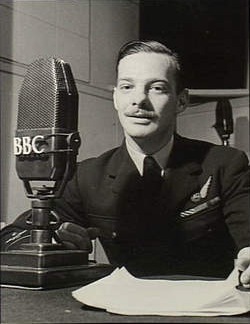 He left the RAAF in 1948, returning to Britain to join the RAF where he worked as an air traffic controller. He married Thelma Madge Peacock in 1948 and they had five children. Foxlee finally retired from the RAF in 1957 and, after farming for a while in Kent, took the whole family to live in Australia in 1962. He came back to Britain once more in 1977, and died in Nottingham on 6 March 1985. Survived war. Died 6 March 1985. Further information about Toby Foxlee and the other 132 men who flew on the Dams Raid can be found in my book The Complete Dambusters, published by History Press in 2018. Jan, would love to catch up with you next I am in Australia, trying to put together the Foxlee family tree would be good to fill in some blanks I have. Kellie, I knew the Foxlee family (a little), when they lived next door to my grandparents’ cottage above Charing. I remember when they returned to Australia. I tried sending a letter to Toby in Australia after my grandmother died but it was returned ‘gone away’. We were living in Lincoln at the time, and I see that they were back in England and that he died not far away from us! He was a lovely man. Hi Judith, Jan, thank you for mentioning the kind words for my Father, it is fantastic to read the responses you both have written, I was lucky enough to attend the 70th commemoration at Scampton on Thursday last with my wife Karen, and meet both Les Munro and Johnny Johnson and their family. I am putting together a book of my fathers life and It would be good to get in touch and some stage to extract some of those memories you have. Hello Simon, How wonderful that you were able to celebrate your father’s very courageous action, but a shame that he is not still around to enjoy it himself also. I think that this is a public post, and am not sure if you can get my email from this, but if not, do contact me through Facebook (which I don’t use much, but my daughter is away travelling, so I check it most days at the moment). I don’t have a photo, but am in Colchester – (there are very few of my name there). I look forward to being in touch – I remember the day you were born and your father told me across the hedge! Very long time no see – Christmas 1962 in Ashford if I recall. We often used to be partners in country dancing at primary school in Charing in 1960. Our mothers were very friendly at that time. We lived about a mile from you along Bowl Road. We emigrated to NZ in March 1964 and lived in the Waikato District near Te Awamutu for about 18 months. But my father’s health was increasingly poorly so we came back to England where he died in March 1967. My mother died just before your father in March 1984. In now live in County Durham near the former steel town of Consett and am a self-employed accountant. Hi Kellie, keep looking there is so much on the web at the moment re your grandfather. Hi Kellie, I have recently been researching the war service of my Great-Uncle. He was Mick Martin’s Flight Engineer at 50 Sqn and flew with your Grandad too on a number of raids. Only just read the posts today. Would like to keep in touch too. I live in Geelong, and travel to qld a few times a year. Maybe when dad,(Simon) comes over to Australia again we can meet. you can find me on face book or my email address from this site. Our family were very friendly with the Foxlees 1959-62, and our mothers were quite close friends. Their farm was about a mile along the Downs from our house and we used to visit regularly. While in primary school I was friendly with the second daughter Sarah, or “Digger” as she was called. We were often partners for country dancing on Thursday afternoons, a fond memory of a childhood “crush”. We last saw them in December 1962 in Ashford, just prior to their move to Brisbane. We left for NZ in March 1964, and we wished our ship had called in at Brisbane on the way home to England in late 1965 as we were still in contact at that time. I have fond memories of the Foxlees. Good to hear the family is still going strong and Toby is remembered for his part in events long ago. Toby was a really good friend with my parents when he lived in Charing and was kind enough to look after my brother and I when my mother went into hospital for a couple of weeks, although it was back in the fifties I can still remember him teaching us how to shoot rabbits even though I was only about seven at the time. I have always been proud to be able to boast that I was lucky enough to know Toby one of the brave and famous dambusters. My Mother is still alive and knows one or two stories about some of the humorous escapades that my Dad and Toby got up to . I too lived in Charing at that time and attended the primary school 1955-61. I knew the two oldest girls, Jennifer and Sarah. The latter was my regular dance partner for country dancing at the Barn on a Thursday afternoon. I remember Toby for his interest in cricket, and I went along with him sometimes as scorer for the village team. I think Jennifer came too, as I remember after one game we were taken to the beer garden in the pub at the bottom of the High Street for a Vimto. My sister has a picture taken on a trip to St Mary’s Bay on the Kent coast featuring Nicola and another youngster called “Bluey”. I presume our respective mothers had taken a day trip, as they became good friends. We have fond memories of the Foxlees and our time in Charing. And having had a soft spot for Sarah for a short time, I sometimes wonder what happened to her and her family. I did meet Tammy Simpson and Jack Leggo and his wife, I would have liked to have met your father as my Dad flew with him too. I would have liked to have contacted Les Munro to see if he knew my Dad (Bob Hay) also. Unfortunately I tried replying to your message several times, but it was during one of our Christmas storms and nothing seemed to get through, so trying again! Yes, my grandmother and step-grandfather were the Slaters next door. Would you like to message me on Facebook? It would be great to be in touch. Very happy memories of our times at the cottage! Hi, I hope this stream is still active. My late mother-in-law was Toby’s sister Judith (Foxlee) Milner. It so great hearing about our family. Judith adored her big brother and was very proud of him. Must be Kerri, because your post reached my inbox today. I knew Toby and his family in the late 50s, early 60s when they lived in Charing. Toby’s wife and my mother were friends. I used to go with the village cricket team when Toby played, and used to share the scoring with his eldest daughter, Jennifer. Recently, on a visit to my sister, who still lives in Kent, we went past the house which has changed a lot in 50+ years. We recalled memories of picking fruit in the field next door and kennelling our black Labrador which was one of the family side lines. We last saw the Foxlee family at Christmas 1962 just before they left for Australia – Brisbane I believe. Just over a year later, we emigrated to NZ for a while. I live in County Durham these days about a dozen miles from Newcastle upon Tyne. Thinking of the Foxlees brings back fond memories of schooldays long ago. I met Toby when he lived in Keyworth, Nottingham. I was his GP and I looked after him during his final illness. He dealt with that as bravely as one would expect and died with great dignity in the company of Rosemary, the lovely lady he was living with.